Marjory practices exclusively in Family Law, but has a broad Civil Litigation background, having practiced in Aberdeen, Edinburgh and Glasgow and worked in both the Sheriff Court and the Court of Session. She is a trained collaborative lawyer who seeks to achieve negotiated settlements, particularly using the vehicle of collaboration, where appropriate, as she values the respectful Collaborative approach to resolving issues arising from relationship breakdown. 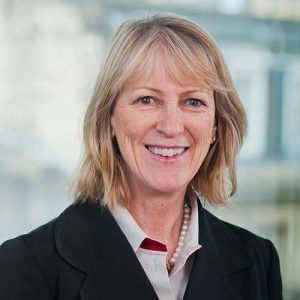 Regard her as a “practical and calm” lawyer who “looks for solutions” (Chambers UK), Marjory is very keen to explore all dispute resolution alternatives to Court, but she will not shy away from litigation if matters cannot be resolved in other ways. Marjory provides financial advice on Separation, Divorce and the Dissolution of Civil Partnership, particularly cases involving complicated or high value assets. She is experienced in handling cases which have cross border and international elements and those involving child abduction and relocation. Marjory advises on the rights and obligations created by co-habitation, regulating these by co-habitation agreements and helping to resolve outcomes if the co-habitation ends. She also drafts pre and post nuptial agreements. Marjory has a broad experience in contact and residence issues involving children and is “admired particularly for her skill in adoption disputes and international adoption” (Chambers UK). She has a particular interest in Child Protection and, generally, Protection from Abuse in all its guises. Marjory has been a part time tutor in Family Law for diploma students at the University of Strathclyde and has acted as a court reporter in Sheriff Court child law matters. She is also a member of the Family Law Association.